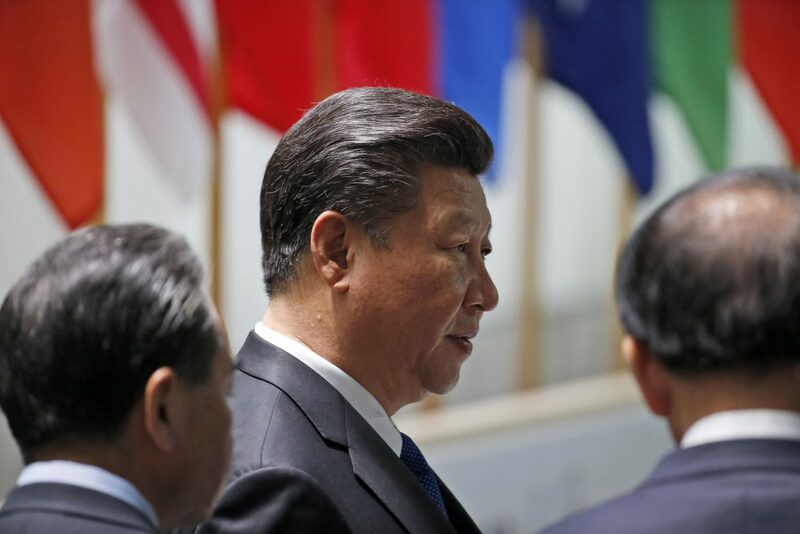 Chinese President Xi Jinping, center, prepares to participate in the afternoon plenary session of the Nuclear Security Summit, April 1, 2016, in Washington, D.C. Photo by Alex Brandon/Associated Press. It is widely assumed in the West that legitimacy of a government comes from universal suffrage and multiparty competitive elections. Yet this assumption raises two issues: First, historically it is not true, as universal suffrage is a recent development. One can claim, for instance, that U.S. administrations only became truly legitimate in 1965, when African Americans were really allowed to vote. Furthermore, this practice is confined only to nation-states. It is difficult to imagine that, say, the European Union could establish its legitimacy and play its unifying role on the basis of universal suffrage. These two points help us better understand why the Chinese sense of legitimacy is vastly different from the Western one; for China is not a typical nation-state, but rather a deeply historical and civilizational state. It is an amalgam of the world’s longest continuous civilization, and a super-large modern state with its sense of legitimacy rooted deeply in its history. An apt analogy would be to something like the Roman Empire, if it had endured into the 21st century—with all its regional and cultural diversities, with a modern economy and a centralized government, with a population nearly equal to that of 100 average-size European nations combined, situated on a vast continent, with its people speaking thousands of different dialects while sharing one written language called Latin. This kind of state, a product of hundreds of states amalgamated into one over its long history, would become ungovernable if it were to adopt an adversarial political model. Such was the case in China beginning with the 1911 Republican Revolution, when the country attempted to copy the American model and degenerated into chaos, with rival warlords fighting each other and tens of millions of lives lost in the decades that followed. As a civilizational state, the legitimacy of China’s government is deeply rooted in its own historical tradition, shaped over the millennia since the country was first unified under the Emperor Qin in 221 B.C. China’s one-party governance today may look illegitimate in the eyes of many Westerners, yet it is to most Chinese nothing extraordinary. For most of the past two thousand years, China has practiced a kind of one-party rule: governance by a unified Confucian elite that was selected through public exams (the Keju) and which claimed to represent—or genuinely represented—most if not all under heaven. Furthermore, during much of the one-party-rule era, China was arguably a better-governed, more peaceful and prosperous state than the European states of the same epoch. China began to lag behind Europe when it closed its door to the outside world in the 18th century and missed the Industrial Revolution. 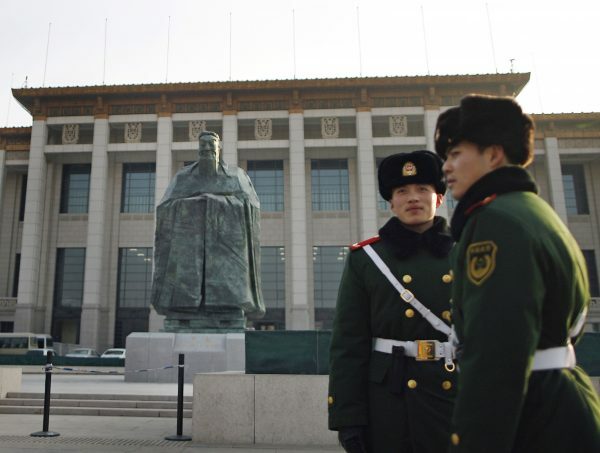 Chinese paramilitary policemen stand guard in front of a sculpture of the ancient philosopher Confucius on display near Tiananmen Square in Beijing, Jan. 2011. Photo by Andy Wong/Associated Press. The first is the Confucian doctrine of the “mandate of heaven,” which has prevailed since the Han Dynasty (201 B.C. to 220 A.D.). Confucius admonished Chinese rulers that “water can carry a boat but also overturn it,” which meant that unless the rulers worked with diligence to ensure good governance (liangzheng shanzhi)—with a particular emphasis on promoting the country’s unity and people’s livelihood—ordinary people could rise up and rebel in the name of “heaven.” In other words, the Chinese mandate of heaven was not a God-given right; the people’s acceptance of the rulers’ legitimacy rested on the condition that the rulers had to perform. This Chinese idea of a “social contract” between the rulers and the ruled preceded the French philosopher Rousseau’s by over two millennia. China’s leaders today have adapted this idea into a sense of mission to realize the Chinese dream of restoring the country’s standing in the world and creating a more just and prosperous society for all. Despite its various weaknesses, over the past thirty years the Chinese state has presided over the world’s fastest economic growth and improvement of living standards in human history. Key independent surveys, including those by the Pew Research Center and Ipsos, show consistently that the Chinese central authorities command a high degree of respect and support within the country. The latest Ipsos survey (Oct. 2016) showed that 90 percent of Chinese are satisfied with the track the country is taking, while only 37 percent of Americans and 11 percent of French feel the same about their countries. Depicting China’s polity as lacking legitimacy, or even being on the verge of collapse, is out of touch with China’s reality. The second concept, which is related to the mandate of heaven, is the idea and practice of meritocracy (xuanxian renneng, or selecting and appointing the virtuous and competent). As Dr. Francis Fukuyama has observed in his book The Origins of Political Order, “It is safe to say that China invented modern bureaucracy, that is, a permanent administrative cadre selected on the basis of ability rather than kinship or patrimonial connection.” China’s Keju system, or civil service exams, was long used to select the most talented individuals into leading positions in government. The Communist Party of China has adapted this tradition for modern China, building a system for selecting its leaders based on merit and performance. For example, China’s top decision-makers (members of the Standing Committee of the CPC Political Bureau, including President Xi Jinping) have almost all served at least twice as party secretaries or governors of a province, which means, given the size of China’s population, they have administered populations of 100 million or more, and performed well, before being promoted to their top-echelon positions. The third concept of legitimacy derives from the Chinese philosophy of political governance, including, among other things, the two distinctive concepts minyi and minxin. The former approximately refers to “public opinion,” and the latter to “the hearts and minds of the people,” and the pair was first put forward by Mencius (372 – 289 BC). Minyi, or public opinion, can be fleeting and change overnight (especially in today’s internet age), while minxin, or “hearts and minds of the people,” tends to be stable and lasting, reflecting the whole and long-term interest of a nation. Over the past three decades, the Chinese state has generally practiced “rule by minxin.” This allows China to plan for the medium and long term, and even for the next generation, rather than for next 100 days or until the next election, as is the case with many Western democracies. The latest Ipsos survey showed that 90 percent of Chinese are satisfied with the track the country is taking, while only 37 percent of Americans and 11 percent of French feel the same about their countries. To sum up, while the West has for so many years engaged in promoting the Western political model in the name of universal values, China has pursued its own experiments in the political domain since 1978, drawing lessons from the disastrous Cultural Revolution, in which ideological radicalism expunged China’s governance traditions and dashed people’s hope for prosperity and order. Thanks to this effort, China has since managed to varying degrees of success to re-establish a connection with its own past as well as borrow many useful elements from the West. China’s meritocratic system today is essentially a mechanism of “selection plus election,” with the former originating from China’s own tradition and the latter imported from the West. Pioneered by China’s late leader Deng Xiaoping, this institutional arrangement has succeeded in ensuring an orderly transition of power for this vast country over the past three decades, and this year may mark a new milestone as the CPC will convene its 19th National Congress. However imperfect, this system is in a position to compete with the Western political model. Indeed, it would be inconceivable for the Chinese system today to produce an awkward leader like Donald Trump. The Chinese experience since 1978 shows that the ultimate test of a good political system is how well it ensures good governance as judged by the people of that country. The stereotyped dichotomy of “democracy vs. autocracy” sounds so hollow in today’s complex world, given the large numbers of poorly governed “democracies” around the world. China’s experience may eventually usher in a paradigm shift in international political discourse from the dichotomy of the so-called democracy vs. autocracy, to that of good governance versus bad governance, with good governance taking the form of the Western political system or of a non-Western one. Likewise, bad governance may take the form of the Western political system or a non-Western one. It follows that, from the Chinese point of view, the nature of a state, including its legitimacy, has to be defined more by its substance, i.e. good governance broadly acknowledged by the people of that country rather than by mere correct procedures. China emphasizes substance over procedures, believing that ultimately the pursuit of right substance will evolve and produce the right procedures, appropriate to each nation’s own traditions and conditions. A plethora of uncertainties are gripping the world today for reasons directly related to how government legitimacy has been defined by the West, and it’s high time to pause and reflect on this issue, and in this context, that China’s age-old wisdom and well-tested practices may be interestingly relevant. Zhang Weiwei is Director of China Institute, Fudan University, China.